You’re like, WHAT DID YOU JUST DO WITH THOSE POOR OATS. I Thai Curried them. Are you mad at me? Or do you want to hug me? Thing is, it’s all because the Bring Your Best Bowl Contest Finalist Flavors of Quaker instant oatmeal are here. Have you heard about this? Oh my gosh. So I made Thai Curry Oats for you. And I’m sort of freaking at how it turned out. It actually works. And it’s not obnoxious. You basically replace rice with oats. That’s it. That’s all. That’s all she oat. I mean wrote. I kept it vegetarian, because I know we all need more meals like that in our faces. And you could honestly add in mushrooms, bean sprouts, whatever you feel like! For this night in my life, I needed simple and glorious. So simple and glorious it was. 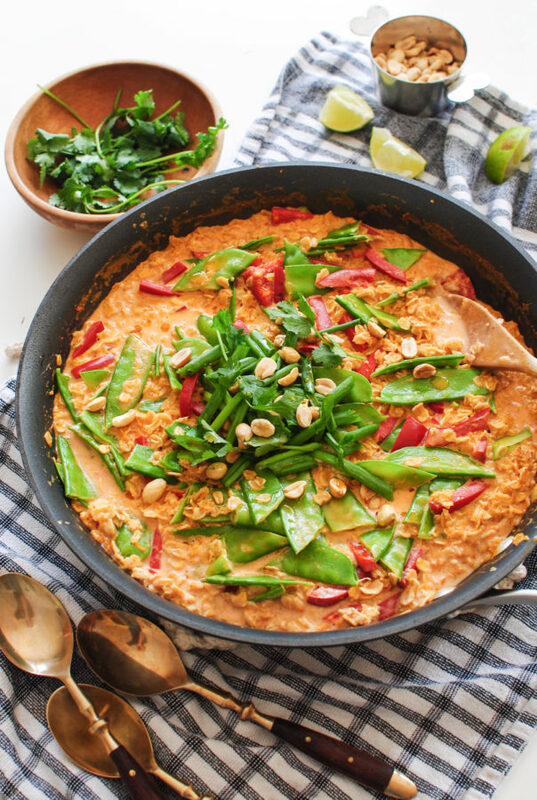 You’ll heat a little bit of Thai curry paste in a big ol’ skillet, then add coconut milk to it. Two cans! This shows my love for you, right? Then you’ll add in Quaker’s Old Fashioned Oats and let it simmer for a sec. 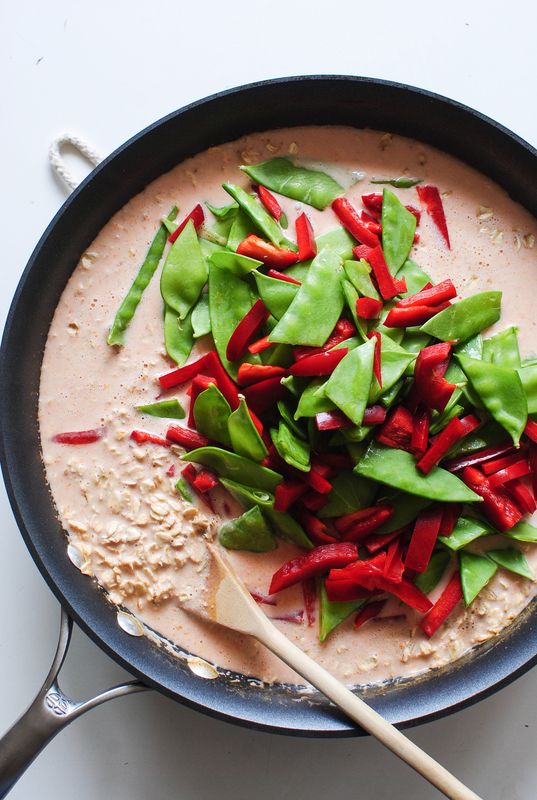 Now, as hard as you can, throw in some red bell pepper and snow peas. Stir it all together and let it curry itself for about five minutes, until everything softens and begins to hum sweet ditties to you. You’ll add lime juice. Cilantro sprigs. Scallion chunks. PEANUTS (hi, texture). And a delicate baby drizzle of hot chili oil. This is because I like my face to rain. You can always leave it off if you’re a sissy. And this is what you’ll get. 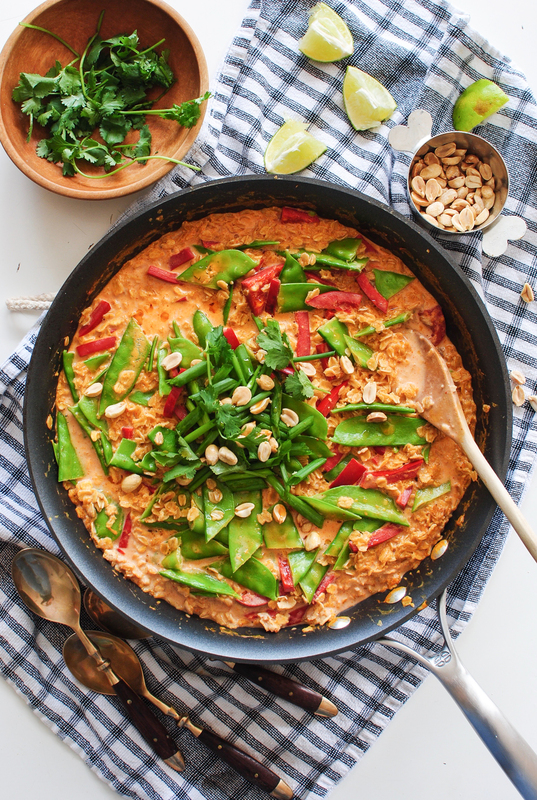 A heapin’ heapidy heap of oat-y, veggie-y curry delight. Spicy with the chili oil. All set to fall straight into your face. 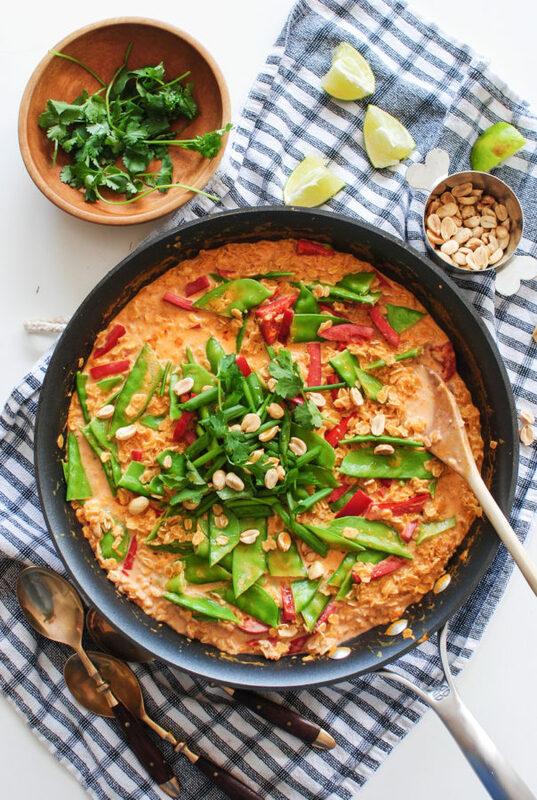 Heat the curry paste in a large skillet over medium-high. Press the paste into the pan, allowing it to caramelize for just a few seconds. 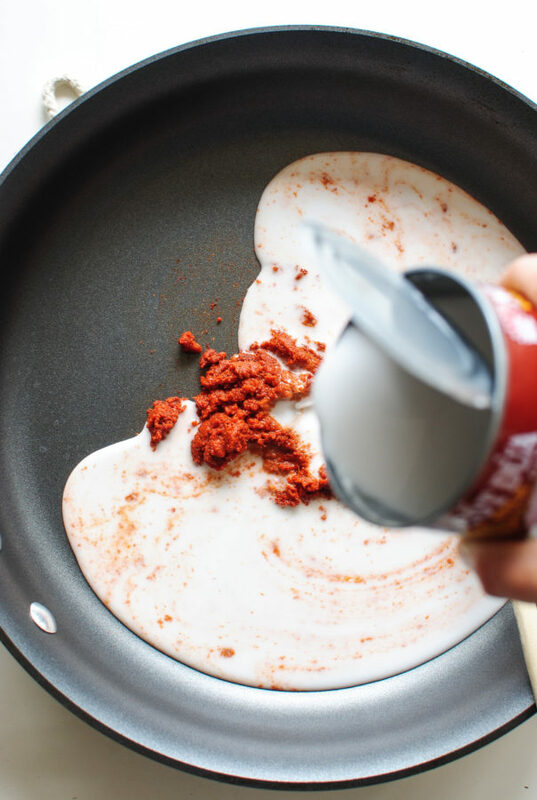 Add the coconut milk to the pan, and stir to combine with the paste. Add the oats and stir to combine. Now add the red bell pepper and snow peas, and let simmer on medium for about five minutes, until the oats and veggies soften. Season with a pinch of salt, and the lemon juice. Let simmer one more minute, then taste. Yowza yum, y’all. Off the heat, top with the cilantro, scallions, peanuts and a tiny drizzle of the hot oil. Or a bigger drizzle if you dig the heat. Serve with extra lime wedges! If you’re into contests, you can totally try each flavor (Apple Cheddar Rosemary – omg, Lemon Ricotta Pancake – holy faces, and Vanilla Chai – hold me now) and go vote for your fave! Voting ends 11/19/16. 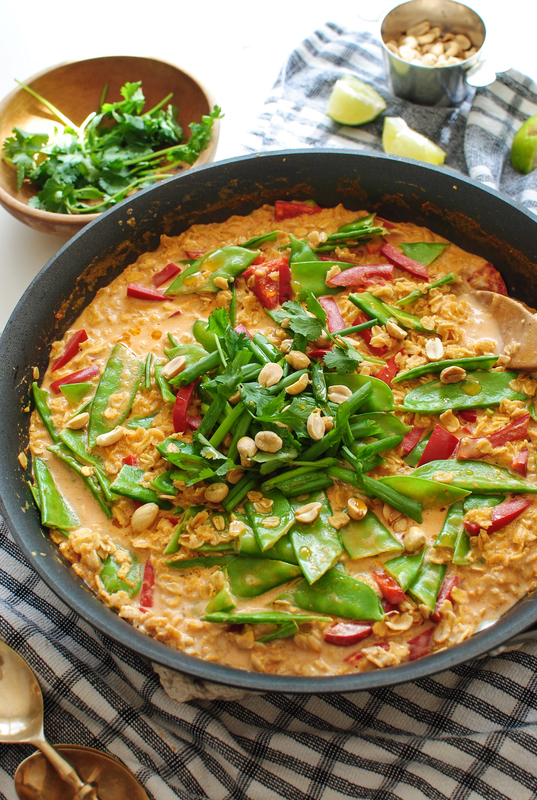 You still can’t believe I Thai Curried my oats, can you? 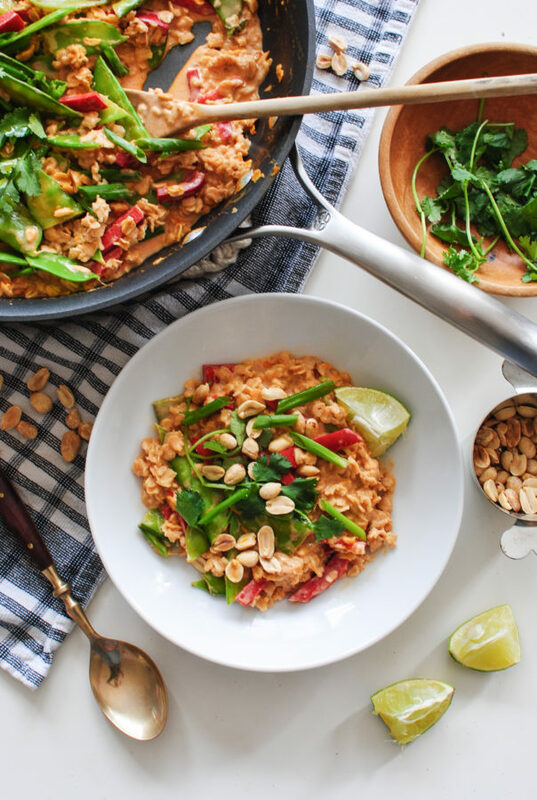 Oats with Thai spin? Okay, this is why I'm not a food blogger! Ha. Although I finally learned how to make a dang good pie crust. Just in time for Thanksgiving. What a fun recipe right before the big day, I like to eat non-Thanksgiving foods before the big day so that it makes it even more exciting!!!! I SAW YOUR TOM'S COMMERCIAL LAST NIGHT!!!! I was shocked...did we know about this? Did I skip an important paragraph or post? My family was like, "Do you know her? Who is that and why haven't we gotten to meet those darling babies?" and then I was kind of embarrassed at my enthusiasm and had to admit I've never met you. Congratulations, all of you! Yesssss! Why thanks! I announced it in the summer. :) So glad you like it! Game changer!! Such a cool idea! Put an egg on it!!! yumyumyum!